Having a good understanding of some important plants, leaves and herbs around us is not only essential for maintaining a friendly atmosphere but as well as for maintaining a healthy body. The fact still remains that we oftentimes fail to come to terms that the plants, leaves and herbs around us are God's own natural pharmacy to us. It is fundamental to understand why it is important to get acquainted with nature as well as note those important medicinal plants and herbs around us for our own benefits. To a larger extent, this will save us both the stress, time and cost of searching for expensive methods of treatment when we are surrounded by free gifts of nature. Whether this is your first time of hearing about Gongronema latifolium (Utazi) or not, you should know what this leaf is, what it does and how it should be used, under what circumstances. This article titled " Benefits of Gongronema latifolium (Utazi) " is a must read! Gongronema latifolium is the botanical name for a local leaf/herb called utazi by the Eastern part (Igbo/Ibo) of Nigeria. The Western part of Nigeria call this leaf arokeke and it is a tropical rainforest plant mainly used as vegetable, medicine or spice by the people. Gongronema latifolium (utazi) is a climbing shrub that reaches up to 5m long with woody base, hollow stems and fleshy roots. Gongronema latifolium (Utazi) has a characteristics soft/hairy stems with latex. The utazi leaves are broad, heart shaped and slightly oval in appearance with a deeply cordate base. The utazi flowers are originally small and bisexual with a characteristics yellowish-green appearance. Gongronema latifolium (utazi) is a seasonal shrub that flowers mainly around July and September in Nigeria. This heart-shaped leaf is characterised by a distinguishable bitter taste especially when eaten fresh however the bitter taste tends to slightly disappear if the leaves get dried. Gongronema latifolium (Utazi) belongs to the class of medicinal plants that are beneficial in preventing and treating certain diseases and ailments that are detrimental to human health. Gongronema latifolium leaf, which can be chewed, infused or used for cooking is mainly used in the Western part of Africa for nutritional and medicinal reasons. Pharmacological studies speculate that utazi has both analgesic, antimicrobial, antibacterial,anti-ulcer, anti-sickling, anti-oxidant, anti-asthmatic, anti-pyretic, hypoglycaemic and anti-inflammatory properties. Despite these impressive speculated abilities of the utazi leaves, future research are recommended to validate these claims. Utazi plant is highly medicinal in nature, which suggests why its health benefits cannot be overemphasized. Researchers agree that the fundamental ingredients used for medicinal purposes are stored in the various parts of the utazi plant such as; the fruits, seeds, leaves, root and bark. The vital medicinal ingredients stored in the various parts of the utazi leaf can be extracted either through blending the fresh leaves, chewing the utazi seeds, leaves or fruits, infusing either the dry or fresh utazi leaves and decoction. However, these various methods of preparing and using utazi leaves for medicinal purposes mainly depends on the part of the utazi plant where the active medicinal ingredients are present. For example, the utazi roots cannot be chewed rather has to undergo decoction, the leaves can be infused with hot water and allowed to cool down before drinking while the fresh utazi leaves can be chewed. 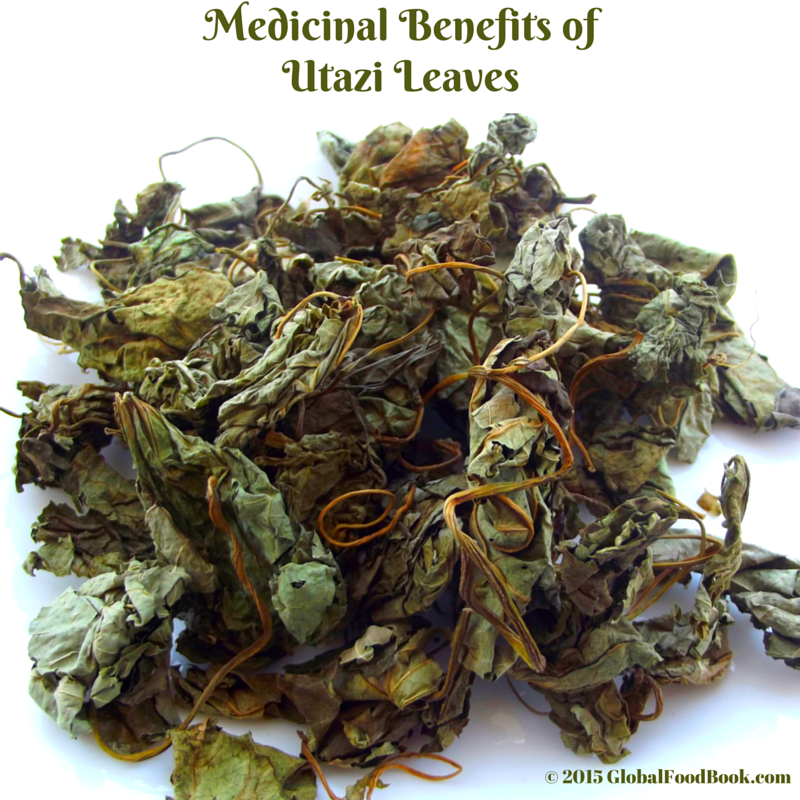 9.Infused utazi leaves are very helpful in treating malaria. Nutritionally, G. latifolium (utazi) is an excellent source of protein and past studies show that G. latifolium (utazi) leaves are suitable for use in food production due to its high amino acid contents. They are bitter-sweet in taste and often used as a local spice and vegetable for food preparations such as; abacha, nkwobi, unripe plantain porridge, ugba, local soups such as nsala (white soup), sauces, salads and isiewu. Africans such as Nigeria, Côte d’Ivoire and Ghana, use the stems and fruits as chewing sticks. Afolabi F. E. (2007), Chemical Composition and Antibacterial Activity of Gongronema latifolium, Journal Zhejiang University Biological Science; 8(5), pp.356-357. Emeka E. J. I. and Obioa O. (2009), Effect of a Long Term Consumption of a Diet Supplemented with Leaves of Gongronema latifolium Benth on some Biochemical and Histological Parameters in Male Albino Rats. Journal of Biological Sciences 9(8): 860–863. Nwachukwu C. U, Umeh C. N., Kalu I. G., Okere S. and Nwoko M. C. (2010), Identification and Traditional Uses Of Some Common Medicinal Plants In Ezinihitte Mbaise L.G.A., of Imo State, Nigeria, Report and Opinion, 2(6), p.4. Ugochukwu N. H, Babady N. E, Cobourne M. and Gasset S. R.(2003), The Effect of Gongronema latifolium Leaf Extract on Serum Lipid Profile and Oxidative Stress of hepatocytes of Diabetic Rats, Journal of Bioscience, 28, p.2–4.